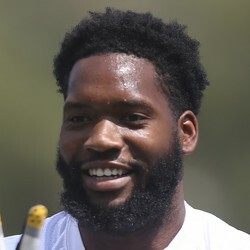 ESPN's Adam Schefter is reporting the Pittsburgh Steelers have released tight end Ladarius Green with a failed physical designation. After one disappointing, injury-plagued season in Pittsburgh, the Steelers are moving on from Green. The veteran tight end battled ankle and lingering symptoms of a head injury since signing with the club last offseason, which led to his release. Jesse James is expected to step into Green's role as Pittsburgh's No. 1 tight end for the 2017 season.